No matter what goes on in our lives, we always have things to be thankful for. We may not have a home of our own right now but we are thankful for whatever roof is over our heads. We have been victims of multiple crimes but we are thankful for all the people helping us navigate the road to justice. I am thankful for everyone who lends their support and good wishes. 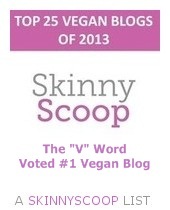 I am thankful to be Vegan and to be part of a growing, vibrant Vegan community. Mostly, I am thankful for my family: I have Tom, Benny, and my Angel Poochie. This year I got something else to be thankful for: I got to go to some events at Woodstock Farm Animal Sanctuary. 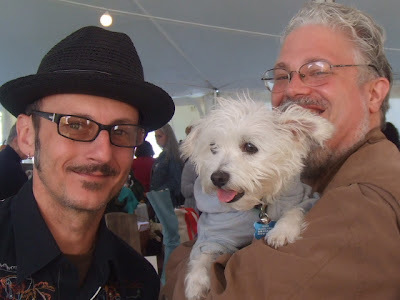 On October 3rd, we attended the 2010 Blessing of the Animals and got to bring Benny along. Benny was very excited to see all the farm animals and it was hard to convince him that he couldn’t go inside the fenced-in areas to actually play with the chickens and the cows. 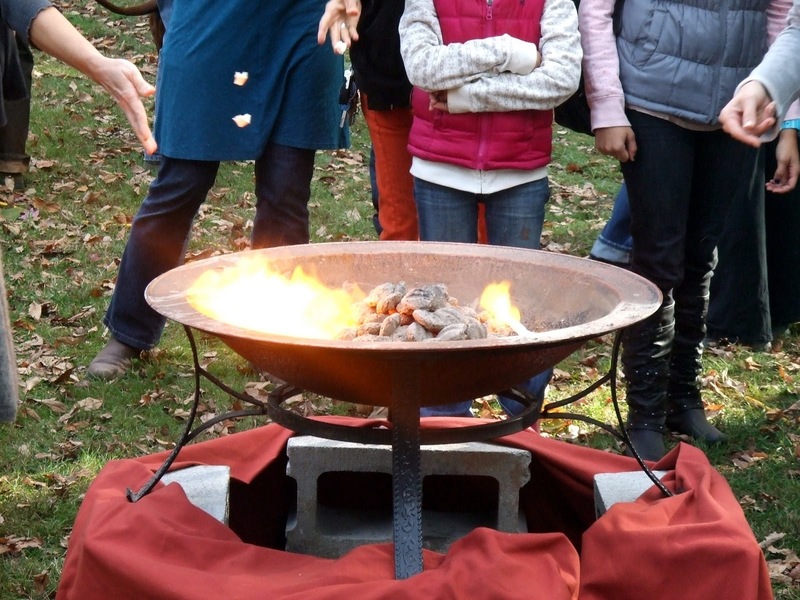 The ceremony was officiated by the noted environmentalist and wild wolf activist Elke Duerr. 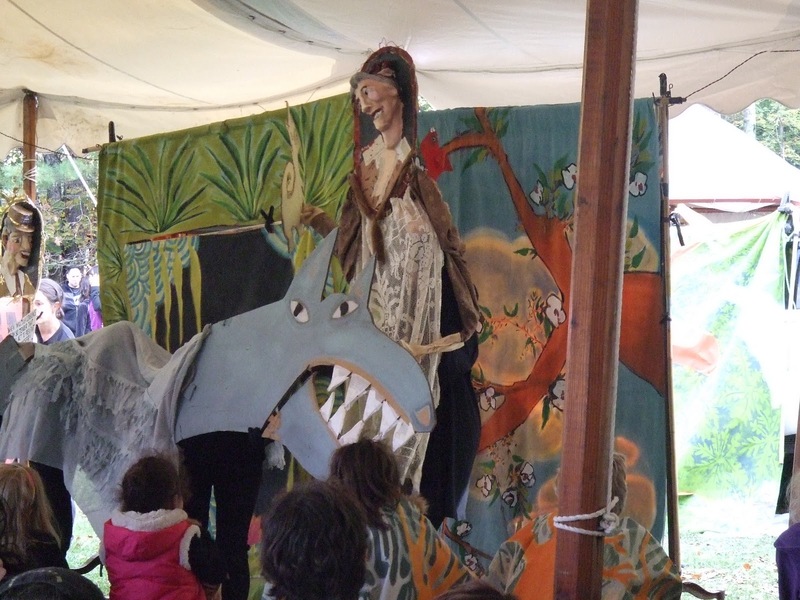 There was also a really cool puppet show put on by the Redwing Blackbird Theater. They performed an alternative version of the traditional PETER AND THE WOLF tale. O Ulster County SPCA had an adoption information table and there were lots of WFAS goodies for sale. The weather was beautiful and the grill was burning with delicious Field Roast sausages with onions and peppers and corn on the cob. There were bags of popcorn and Teany cider, both hot and cold. 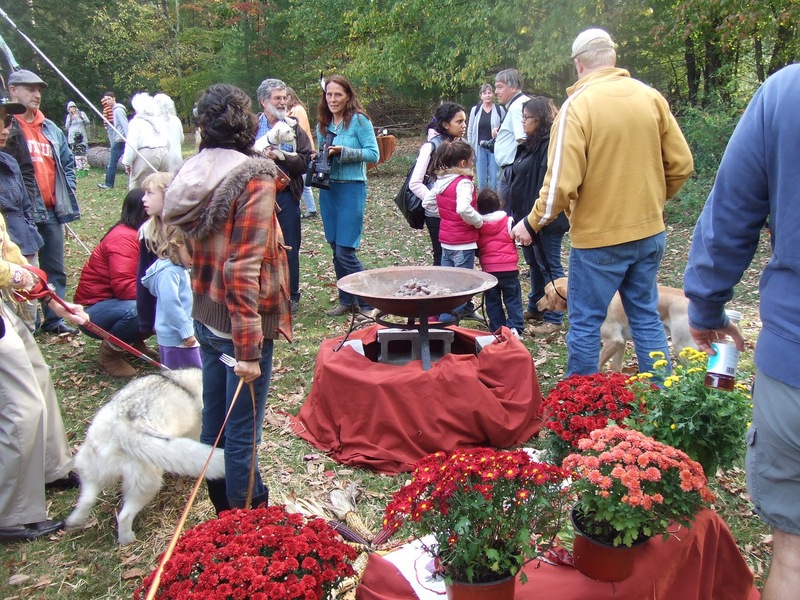 Claro, the most important part of the event was the actual Blessing of the Animals. Everyone got a slip of paper and wrote down whatever blessing they wanted. Then a large firepit was lit and everyone got to toss their blessing into the fire, sending the blessings up to the sky, to the spirits, to Heaven, to whatever and wherever one believes. It was a beautiful ceremony. 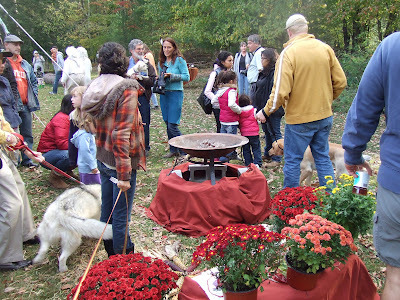 Afterwards, the Woodstock Community Drum Circle played music while people and their pets walked around and visited the animals. 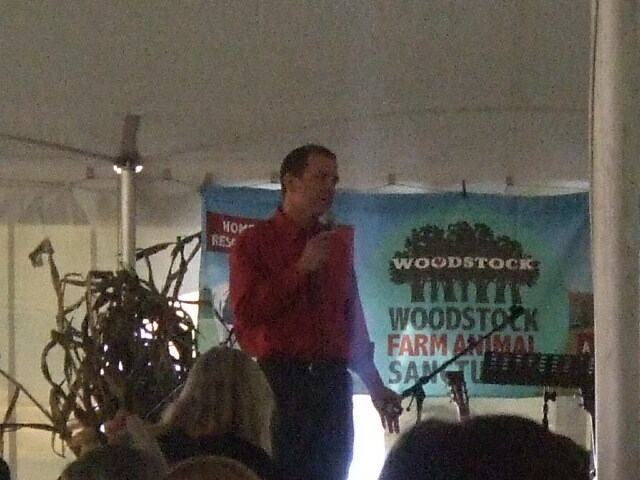 A week later, em 10/10/10, I got to return to Woodstock Farm Animal Sanctuary for their ThanksLiving Banquet. 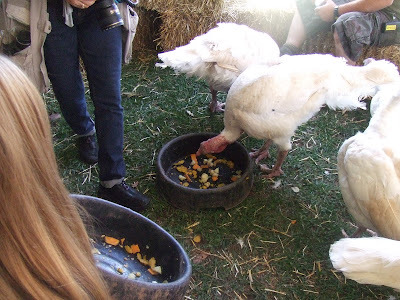 Though this was their 5th annual banquet, it was the first time I ever got to attend a celebration FOR the turkeys. They held it early this year so that people would be eating outside in nicer weather and be able to see the colorful foliage. I didn’t think we would be able to go because we weren’t able to leave Benny alone but Tom called and it turns out they make exceptions for some small, well-behaved pets. Doug Abel said Benny could go. YAY!! That meant I could go. WOO HOO!! The celebration began with feeding the turkeys their special dinner. That was such a great sight to see. 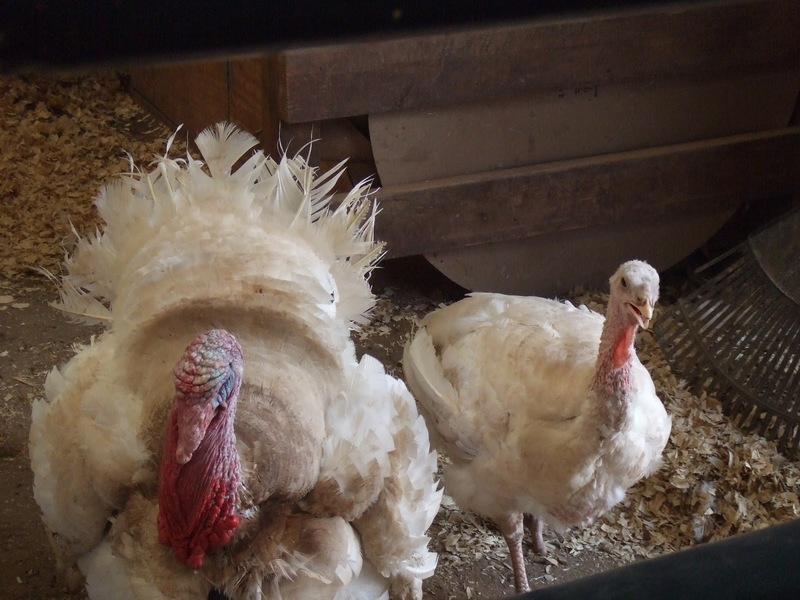 Each holiday season about 65 million turkeys are slaughtered in the United States but these lucky turkeys got to enjoy dinner, rather than be the dinner. There was a giant heated tent set up with beautifully set tables. There were speakers: WFAS founder Jenny Brown and activist Bruce Friedrich (who signed a copy of his book, The Animal Activist’s Handbook, para mim). There was live music from Warren Defever/His Name Is Alive. 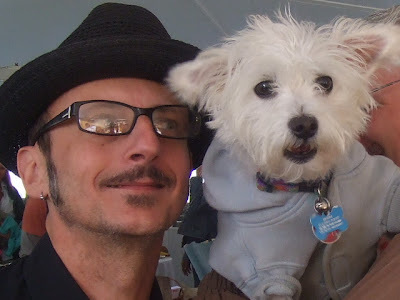 The event was emceed by the hysterical Dan Piraro (who got the honor of having his picture taken with Benny). Just to prove I don’t cut Tom out of all the pictures. 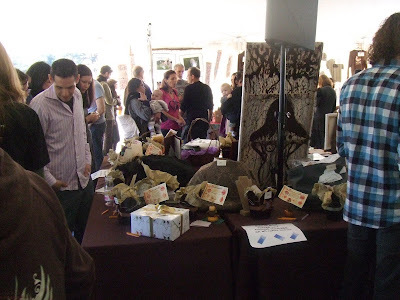 In addition to the tables filled with WFAS t-shirts, sweatshirts, books and other goodies to buy, there was a silent auction and a raffle – I even won a beautiful bag from Etsy. Waitstaff walked around with trays of appetizers such as black-eyed pea cakes, faux gras on crostini, and stuffed mushrooms. 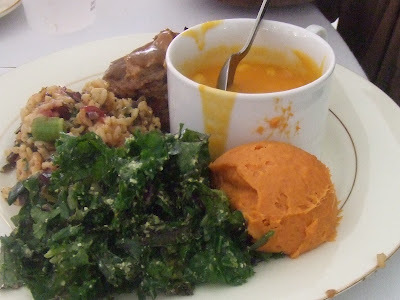 Then there was the feast prepared by David Silver of Second Helpings: Butternut Squash Chowder with Roasted Corn, Kale Salad, Wild Rice Salad, Mashed Yams and Grilled Seitan Steak. Everything was so delicious especially that soup. I wish I had a bowl of that butternut squash soup right now. Each table got a tray of incredible desserts from Vegan Treats and Cocoa V. Surpreendente! Após o jantar, we walked around and visited the animals. It was such an incredible day, we didn’t want to leave (especially Benny; he still wanted an up-close visit with the chickens). Just when we thought it couldn’t get any better, we each got a goodie bag filled with Vegan treats and products on the way out. We had such a wonderful time and it was so great to see the turkeys running around enjoying their dinner and their lives. But it’s important to remember that that is not the reality for millions of turkeys in the U.S. and all over the world. 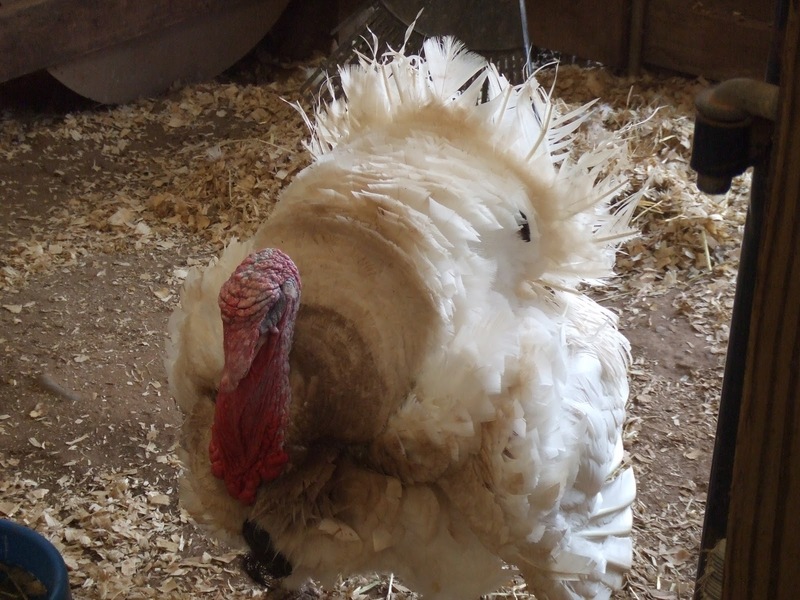 On the WFAS web site, there is a page called “Black Thursday” which has several undercover videos of what turkeys go through in their short, tortured lives just to become someone’s dinner. They are graphic and hard to watch but it is important to know the truth. 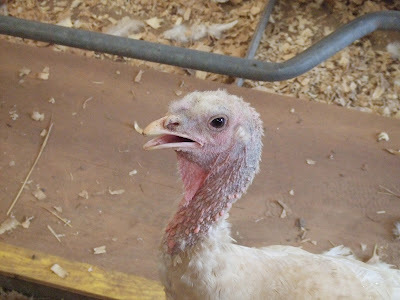 The page is located at http://www.woodstocksanctuary.org/2010/11/black-thursday/ There are also links for sponsoring a turkey and yummy, cruelty-free Vegan recipes. 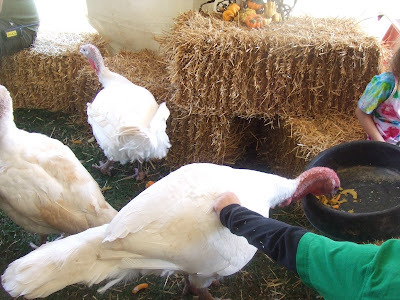 We are so thankful for Woodstock Farm Animal Sanctuary for all they do, for allowing Benny to attend ThanksLiving, and for the wonderful time we had at the banquet. We hope it becomes an annual tradition for us. Happy ThanksLiving to all and remember to choose compassion this holiday season and all year long! Me too. It was the best day I’ve had in such a long time.